Thank you. My new dado head just arrived safely. Thank you for the prompt service and outstanding customer service. 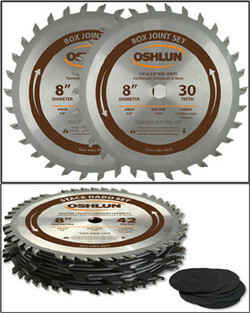 Oshlun 2 piece Box and Finger Joint Sets are perfect for woodworkers who want to make precision box joints at an affordable price. The high tooth count saws produce smooth, square notches and fingers in the two most popular sizes, 1/4” and 3/8”. The precision ground C-4 micro grain carbide tips stay sharp longer and cut through all types of hardwood and softwood with the greatest of ease. Each set also includes detailed setup instructions and comes packaged in a full color storage/carrying case. 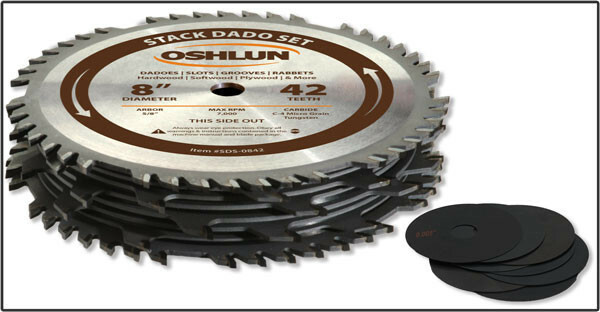 Oshlun's 16 piece stack dado blade sets are perfect for woodworkers who want a premium cut at an affordable price. The high tooth count saws and chippers produce smooth bottom dado cuts ranging from 1/4" to 29/32". The precision ground C-4 micro grain carbide tips stay sharp longer and cut through all types of hardwood, softwood, and plywood with the greatest of ease. The full body chippers make for an easier setup and less vibration when compared to other sets that feature wing style chippers. Each set also includes detailed setup instructions and a shim set for fine adjustments. Set includes 6 chippers: 4 pcs. 1/8", 1 pc. 3/32" and 1 pc. 1/16" thickness. Set also includes 8 shims: 2 each of 0.005", 0.010", 0.015" and 0.020" thickness. Designed to cut undersized to accommodate "nominal thickness" plywood. The 3/32" Chipper and Shim Set are supplied to provide maximum adjustability. THREE $5.00 OFF Sharpening Coupons included with purchase of this item.